WASHINGTON - The number of Americans filing for unemployment benefits increased less than expected last week, a sign that the labor market was continuing to tighten. Initial claims for state unemployment benefits rose 5,000 to a seasonally adjusted 239,000 for the week ended Feb. 11, the Labor Department said on Thursday. Data for the prior week was unrevised. Claims have been below 300,000, a threshold associated with a strong labor market, for 102 consecutive weeks. That is the longest stretch since 1970, when the labor market was much smaller. The labor market is at or close to full employment, with the unemployment rate at 4.8 percent. 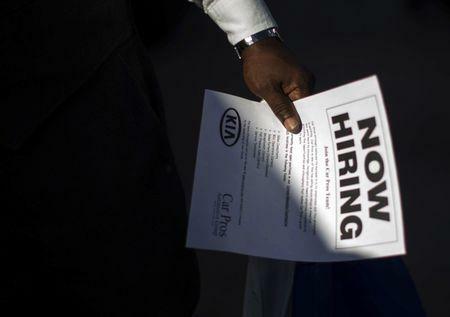 Economists polled by Reuters had forecast first-time applications for jobless benefits rising to 245,000 in the latest week. A Labor Department analyst said there were no special factors influencing last week's data and no states had been estimated. The four-week moving average of claims, considered a better measure of labor market trends as it irons out week-to-week volatility, edged up 500 to 245,250 last week. The claims report also showed the number of people still receiving benefits after an initial week of aid slipped 3,000 to 2.08 million in the week ended Feb. 4. The four-week average of the so-called continuing claims rose 4,250 to 2.08 million. Does the US Have Enough 'Fiscal Space' to Fight the Next Recession?